"Amongst them were our own earliest ancestors, whose survival would decide whether we humans would exist at all." The epochal documentary series Walking with Dinosaurs and its successors comes full circle with a prequel series, Walking with Monsters, which examines life on Earth from its beginnings through to the rise of the dinosaurs. Using CGI and the same faux-natural habitat techniques that made the others in this series so successful, this epic of several hundred million years is made accessible as it has never been before. These three episodes cover the Paleozoic Era, a time period that extends back to 540 million years ago. Although the fossil record is spotty in some respects, in others this is a fairly well-documented time period, with a rich variety of life for the filmmakers to choose from. The first episode covers the Cambrian, Silurian and Devonian periods, passing quickly over the less-interesting single-cell creatures and dull trilobites that are probably the only thing most people know from this time period, and heads straight to the deadly conflict that makes up life and the evolutionary procession. In this first episode, the focus is on the conflict between the fish ancestor of man, Cephalaspis, and the arthropods such as the massive Brontoscorpio, a meter-long scorpion that was an early creature to make the step from the seas to land. The second episode deals with the Carboniferous period and the early Permian, with the amphibians having to deal not only with even more monstrous arthropods but the first reptiles. Particular emphasis is given to the life of a Mesothelae, an immense spider. The early Permian sections are focused on the sail-backed creatures Edaphosaurus and the familiar Dimetrodon, not yet dinosaurs though frequently confused with them, bearing characteristics of mammals as well as reptiles. The drama here centers on a mother Dimetrodon's struggle to protect her clutch of eggs over a seven-month period, fighting off other creatures as well as the cannibalistic members of her own kind. The final segment covers the end of the Paleozoic, the late Permian period, with special attention to the predatory Gorgonopsids and Scutosaurs, as well as climactic change that converts much of Pangaea into a massive and nearly lifeless desert. The first half of the program is devoted to the decline of life around a desert waterhole as part of the mass extinction at the end of the Permian. It's an interesting touch that brings into focus just how precarious life is and the variability of climate as a trigger for evolutionary change. The last segment takes us into the Triassic period of the Mesozoic, with one of the most successful creatures of all time, the Lystrosaurus, which at its prime made up half of all life on Earth, but which would eventually give way to the rise of the true dinosaurs. The documentary style works exceedingly well here, with the creatures on occasion interacting with the camera (the Brontoscorpio attacks it and breaks the lens, while the Lystrosaurus sniffs it curiously), bringing a spellbinding "you-are-there" aspect to the proceedings. Kenneth Branagh again contributes the narration (no alternative US narration is provided for this series) and he does fine work with it, keeping it conversational without lecturing the viewer. The narration is careful to keep relevance by pointing out ways in which the critical evolutionary moments relate to our own lives. The drama of combat is ever-present, keeping the proceedings interesting, though not terribly gory. The animation in this series is the strongest yet, being much more convincing than in its predecessor series . In particular, the amphibians look utterly life-like. The running Dimetrodon occasionally looks a little silly, but then running lizards tend to have an equally silly look, so that's not exactly a criticism. As usual, the lack of clarification between what is known to be fact and what is speculation hurts it a bit from a pedagogical standpoint, but it certainly succeeds in bringing an era of Earth's history to life admirably. 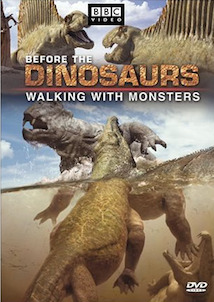 It's unclear why BBC Video's marketing department decided to minimize the familiar "Walking with" brand for this set (in the process removing it from the first position, which it held on television); one explanation could be the large and always-salable word "Dinosaurs" in eye-catching gold type. To be fair, there's some good dino footage here too at the end of the last episode. Image Transfer Review: The anamorphic 1.78:1 widescreen picture is generally quite attractive, and quite colorful. Details and textures in the closeups (which are surprisingly common for CGI) are excellent. Some of the medium and longer shots have a softness that may be part attempt to simulate documentary footage and part to disguise the shortcomings of the CGI. But the transfer looks fine overall. As befits a new production, there is zero damage visible. The RSDL format provides plenty of breathing room for high bit rate, which is much appreciated. Audio Transfer Review: The 2.0 audio track has excellent range and plenty of surround information. The growls and thumps of the monsters have a nice presence and solid bass representation. The track is clean and Branagh is always easy to understand (though for the technical names the subtitles are still handy). Extras Review: The only extra is a "making of" documentary, Trilogy of Life (28m:29s), which is a bit disappointing, since it covers all three legs of the series (apparently Walking with Cavemen doesn't count for their purposes, perhaps because it doesn't use CGI to nearly the same extent as the others), resulting in somewhat short shrift to this one. The Dinosaurs bonus materials already covered a lot of this territory, though there is some good discussion of the impact of that series and the ensuing backlash from creationists. The discussions include the directors, artists, paleontologists and others, making it interesting if rather thin. I really would have liked a full audio or text commentary that would provide the paleontological bases for the statements made in the program, and separating fact more clearly from conjecture and guesswork. In essence, while I greatly enjoyed the program, I'd like to see the footnotes. A worthy successor (or predecessor, in geological time) to the others in the series, with even better CGI. Highly recommended.